More and more attention is being paid to the social determinants of health—the conditions in which people are born, grow, work, live, and age, including factors such as income support, education, transportation, and housing—and their contribution to health and well-being. Despite all the evidence about how the factors affecting our health dwarf the impact of the health care we receive, it remains a challenge for state leaders to act. Why don’t state budgets reflect what we know about improving the health of populations? What are examples where, in spite of the barriers, these challenges are being overcome? This report, written by Elizabeth Bradley, faculty director of the Yale Global Health Leadership Institute, and Erika Rogan, attempts to answer these questions. Based on focused discussions with state and local public health sector leaders, the report identifies the root causes for states not making overall budget and policy decisions that optimize their population’s health. 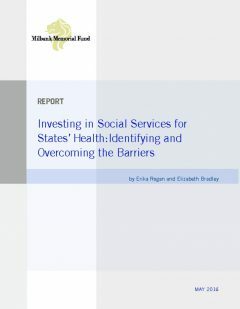 The report then summarizes four site visits—to Vermont, Rhode Island, Kentucky, and San Diego County—and examines how these communities, in spite of these challenges, are “moving upstream” and investing in social services to prevent downstream health care problems. The strategies are as diverse as the populations served, but common themes emerge. By linking a strategic problem-solving approach to specific examples, the report provides new insights to a fundamental challenge for health and human services leaders and anyone interested in helping all members of a community live longer and healthier lives.